Salavat Yulaev claimed an overtime win over Avtomobilist to go 2-1 up in its Eastern Conference semi-final. The second game was rather more clear cut, with Avangard enjoying a comfortable win at home to Barys to move ahead in that match-up. Linus Omark set a new club record for playoff scoring in the KHL as he helped Salavat Yulaev to an overtime victory in game three of this Eastern Conference semi-final. The Swede moves on to 46 (12+34) points from 51 post-season games for the Ufa team, going clear of Alexander Radulov’s mark. Omark’s contribution was telling. After 11 minutes of overtime, with Ufa on the power play, he collected a Vladimir Tkachyov pass in the right-hand circle. Seemingly poised to shoot, the forward held the puck until Yefim Gurkin committed himself on defense then deftly switched the play for Joonas Kemppainen to rifle home the winner. The Avtomobilist bench immediately challenged the play, claiming goalie interference, but the video review confirmed the goal. 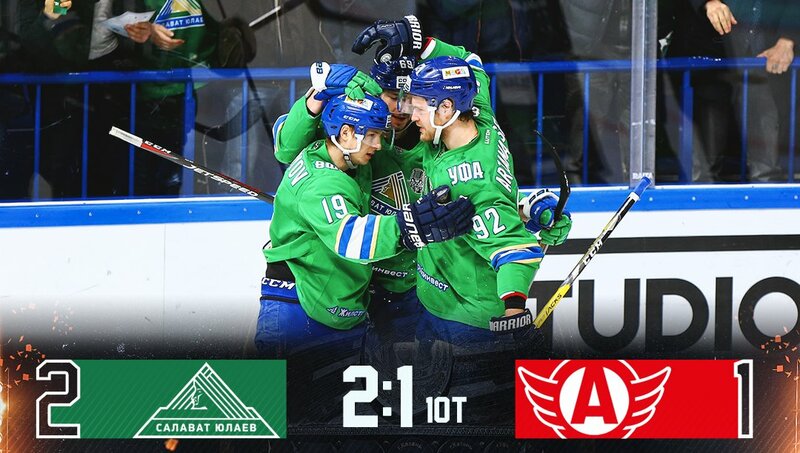 The win puts Salavat Yulaev – the lowest-ranked team left in this season’s competition – 2-1 up in this series against the Eastern Conference leader. But, once again, this was a game dominated by the goalies. The teams shared 85 shots over the 72 minutes of action but produced just three goals. Moments like Jakub Kovar’s sprawling double save late in the first period to deny first Omark then Philip Larsen were a big part of the tight scoreline even though the gameplay was far from cautious or cagey. Amid all that offensive verve, though, it was a defensive lapse that presented the opening goal. Avtomobilist defenseman Nikita Tryamkin was too casual about a clearance from the corners and offered Tkachyov the chance to intercept. The home forward still had plenty to do to get the puck under control and find a way past the impressive Kovar but he solved those problems with some flair to give Salavat Yulaev the lead midway through the game. Tryamkin would make amends in the third period, though. Salavat won a face-off at the home end as Avto sought to kill a penalty. The puck went back to the defenseman whose first-time effort clipped Alexander Kucheryavenko’s stick and whistled past Metsola to tie the game. The visitor arguably shaded the closing stages, without finding a way to win in regulation, and once the game went to overtime another penalty on Avtomobilist – the seventh of the game – saw the men in green take the verdict. It was a tough game. It felt like neither team was playing with a defense and it took some great play by the goalies and our penalty kill to keep the scoreline down. We had a lot of needless penalties and we put ourselves in trouble. I had some concerns about our forwards: there were chances, but we didn’t score. To get to where you need to be, it’s hard, it’s painful. They didn’t allow us to get to the slot and, to be honest, we didn’t work hard enough to go there. I agree that even though the score makes it look like a tight game, this was anything but. Both teams fired in a lot of shots. For a long time, we couldn’t score on the power play but happily we got it right in overtime. 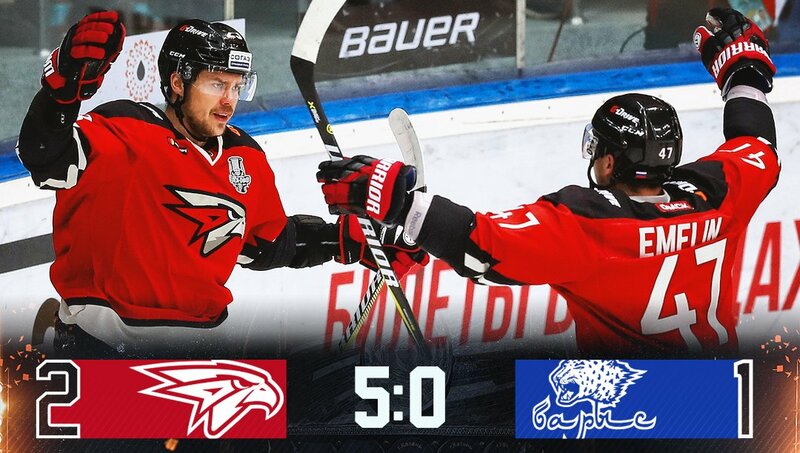 A parade of power play goals lifted Avangard to a comfortable victory over Barys in Balashikha. The visitor picked up 53 minutes in the box – 25 of them applied to Patrice Cormier’s slash on Ansel Galimov midway through the third period – and allowed four power play goals plus another in 4-on-4 play. It was also a memorable evening for home goalie Igor Bobkov. In addition to his second shut-out in this season’s playoffs, he collected an assist to record his first ever point in post season. That helper came on the first goal as Avangard converted its first power play of the game in the 14th minute. In truth, Bobkov’s contribution wasn’t huge: he merely pushed an aimless clearance to Alexei Emelin as the Hawks prepared to change lines. Emelin then released Andrei Stas and the fireworks started. The Belarusian forward collected the puck on the red line, slalomed his way through the Barys defense and finished with an unstoppable wrist shot over Henrik Karlsson’s glove. Stas had just two goals in 45 previous playoff outings; this was a memorable third entry on his resume. However, it was the only goal of a first period that offered few clues as to what was coming. The teams were fairly evenly matched, with few shots at either end. Avangard extended its lead early in the second frame with a power play effort from Sergei Shumakov. That was another well-crafted goal and took the forward to seven in the current playoffs, while Taylor Beck collected his eighth assist. At the end of the period, Sergei Shirokov added a third on yet another power play and Avangard was firmly in control of proceedings. The only even-strength goal of the game made it 4-0 when Kirill Semyonov exchanged passes with Viktor Stalberg to slice through the defense on an odd man rush. Then came Cormier’s departure after his assault on Ansel Galimov and the subsequent power play saw Cody Franson wrap up the scoring with helpers from Shumakov and Beck to move them both to 10 points for the playoffs and stay out in front among their team’s scorers. I can’t see we were totally outplayed in this game. We started out OK and the first period was pretty even. I guess our power play chance in the second period was the turning point. In general, we failed on the PK and the PP – Avangard scored on us almost every time. Our discipline let us down. But, despite the scoreline, it’s only one game and the series goes on. It was one of those nights where you just say ‘Bravo!’. In the first period Zernov and Desharnais had to come off the ice and get help from the doctors. But it’s a playoff, these are hard, tough games. The only worry is that so much of this series is played in your head. We got into a few holes, but our other players did an unbelievable job to dig us out of them. We were left with only Stas and Semyonov among our centers and defense did a great job. This was our best game of the series so far but we’re taking nothing for granted. We haven’t forgotten that Barys won the Chernyshev Division ahead of us.